Financial Innovation: Were There Any Benefits At All? Can I argue -- setting aside rising home prices -- that mortgages got more expensive between 2001 and 2005? Probably not. The low fed funds rate really does seem to be the reason behind the rising spread. Second, there is more than one way to judge the success of securitization. Kwak cites one, but another measure is the number of people eligible to get credit, which certainly went up during the credit boom. 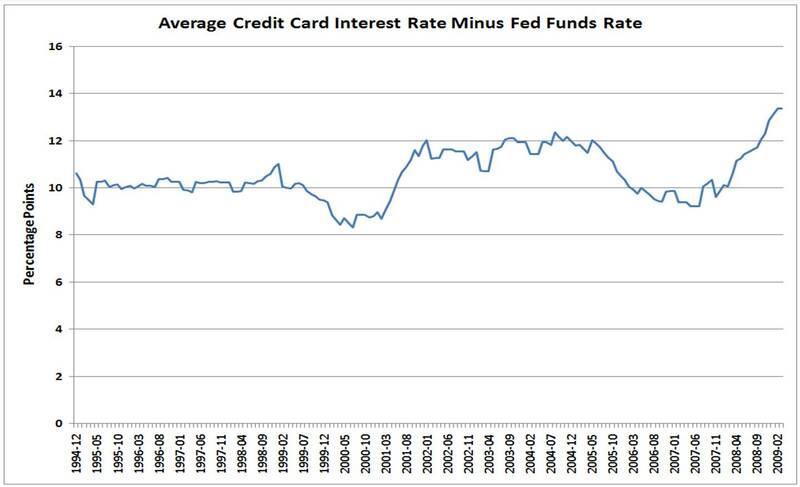 And under this scenario, that means the pool of people getting credit cards got riskier, which could explain why card companies didn't cut rates in line with fed funds. The mortgage industry took the same approach, which turned out to be a less-than-surefire defense against the greater chance that more customers would default.